Did Elvis play here? Probably not, but Johnny Cash did. The Cottonwoods, a jumpin' dance joint between Albany and Lebanon, hosted a dizzying array of music legends. Today, it's just a vacant lot. The bad guy simply walked out the back door of the Salem Motel 6 during a conjugal visit. Here's the story. When astronaut Jim Irwin came to Bend for lunar landing training in the lava rock of Oregon's 'moon country,' he made friends with a local resident — who gave him a sliver of Oregon lava to leave on the moon's surface. And so he did. When the moon is full and hanging low in the sky over Central Oregon, take a good close look at it. 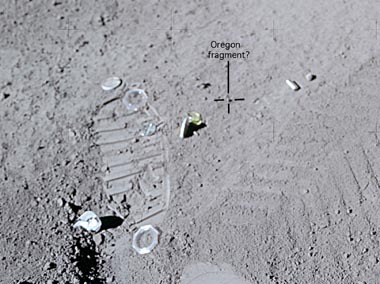 In one of its craters, surrounded by tire tracks and boot prints and the abandoned “moon buggy,” a tiny chunk of Oregon lies on its surface. 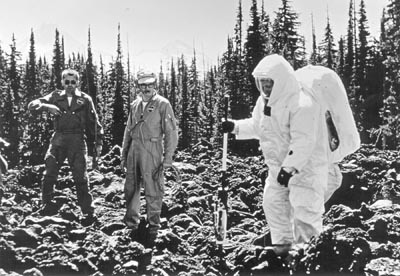 Starting around 1964, NASA started sending future lunar astronauts to various unusual places to study volcanic geology and to familiarize themselves with landscapes that they thought they might encounter on the moon. Although terrestrial telescopes were excellent in the early 1960s, nobody really knew what the astronauts would find when they arrived on its surface. So, to give them both scientific knowledge and operational familiarity, astronauts like Buzz Aldrin, James Lovell and Jim Irwin were sent to a variety of places around the world that were known for unique volcanic features: Iceland, Hawaii, Meteor Crater in Arizona — and Central Oregon. and durability in a Central Oregon lava flow during the early 1960s. 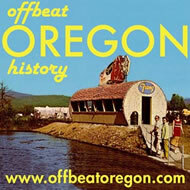 Central Oregon had rather a lot to offer the astronaut-scholars, so they spent a lot of time here. They studied Hole in the Ground, Fort Rock, the Newberry Crater — and, of course, the McKenzie lava fields. Bend, being a relatively decent-sized town in the middle of all these features, naturally became a sort of field headquarters for NASA scientists and astronauts. 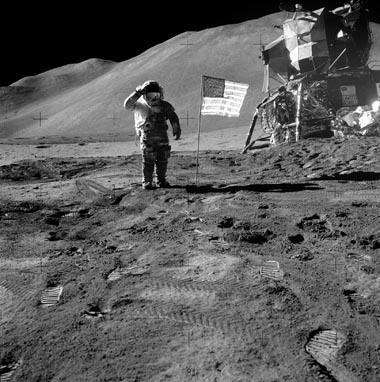 NASA was very pleased with Central Oregon’s helpful and enthusiastic response, and its astronauts and scientists in Oregon started referring to Bend as “Moon Country” — a term that some historians think actually originated with the Bend Bulletin newspaper, but was quickly adopted by NASA personnel. As the space program intensified, so did NASA’s connection to Central Oregon. In 1965, it staged an international lunar geological field conference in Bend, featuring more than 100 of the best and the brightest members of the team that was then pouring everything it had into the goal of landing the moon shot. Legendary Oregon science journalist Phil Brogan, at the time a staff writer for the Bend Bulletin, must have thought he’d won the lottery. It was the following year that astronaut Jim Irwin came to Bend; like his colleagues, he came to study and to practice. rock is within this photo, next to one of the many footprints. When Irwin and the others arrived, the city threw a welcoming dinner for them at the Bend Golf Club. Each astronaut was paired up with a local host, whose job it was to make sure his guest didn’t get bored or overlooked. 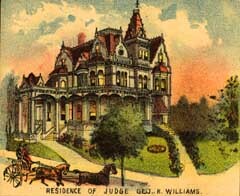 Irwin was assigned to a fellow named Floyd Watson, the building inspector for the city. The two of them must have gotten along well, because Irwin remembered Watson five years later, when he was picked for the Apollo 15 moon landing — the first of three lunar missions that involved putting a car on the moon (the Lunar Rover) and driving it around the surface. When Watson heard his old friend had been picked as the lunar-module pilot for the mission, he got out a chunk of lava rock that he’d picked up near Devil’s Lake — the one near Bend, not the Devil’s Lake in Lincoln City. With a hammer, he chipped a chunk off of it that weighed no more than a few grams, slim enough to slip into an envelope, and then posted it off to Irwin with a letter congratulating him on being selected for the historic mission. Off went the letter, and Watson thought little more of it. It had been a long shot, of course, and there was no guarantee Irwin even remembered who Watson was. 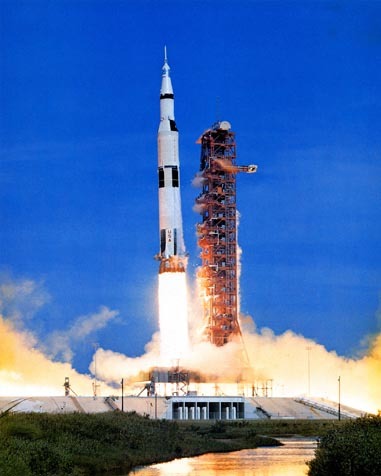 A few months later, on July 26, 1971, Irwin blasted off from Cape Canaveral, packed into the Apollo 15 module with commander David Scott and command-module pilot Alfred Worden. Scott and Irwin spent three days prowling the surface of the moon while Worden orbited above them. And a few weeks after their return, Watson got a letter from Irwin. Watson treasured the letter, picture and the chunk of rock that he broke the lunar sliver off of for the rest of his life. And, of course, he never looked at the moon the same way again. Irwin never told his higher-ups at NASA about the lava, though. This was probably because he and Scott were reprimanded after their return. It seems they’d cut a private deal with a postage stamp dealer to haul a bunch of postal covers up to the moon with them, to be autographed and sold upon their return. With Irwin and Scott in that kind of hot water, they were probably reluctant to admit to having brought up any other unauthorized cargo. And indeed, NASA officials were at first skeptical about the claim of Oregon lava on the moon. 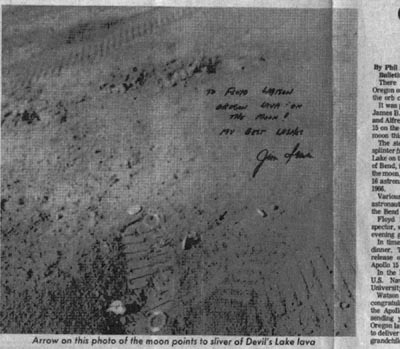 However, perhaps the letter got NASA thinking about it, because a few years later the space agency got a similar request from Oregon Public Broadcasting reporter Sierra Jenkins, and Eric M. Jones, editor of the Apollo Lunar Surface Journal, took a closer look at some of the photographs from the mission. Cross-referencing them with Irwin’s letter to Watson, he was able to identify the rock, and confirmed the story as almost certainly true. Thus, we can consider — with apologies to martyred Great War poet Rupert Brooke — that there’s some corner of a foreign world that is forever Oregon.